New research has identified tax-dodging blackspots in certain parts of the country. The Revenue Commissioners secured court judgments worth more than €106m against tax defaulters during the past two years, new data reveals. But an analysis of the data, matching the country's 139 Eircode routing keys, effectively geographic districts, with judgments secured by the Revenue against tax defaulters, shows significant variations. For example, the research, conducted by debt analysis experts StubbsGazette and UK technology firm Sagacity Solutions, indicated people living in north county Dublin were seven times more likely to be brought to court for not paying their taxes than people living in Mayo. The analysts calculated the number of judgments per thousand individual addresses to measure the frequency with which judgments were entered against tax cheats in different parts during 2016 and 2017. The average number of judgments per thousand addresses was 2.4 across the 16 north Dublin districts, compared to an average of just 0.33 across the six Mayo districts. The data also revealed that seven of the top 10 Eircode districts in terms of judgment per household were in north Dublin. The highest concentration was in Oldtown, an area with just 508 Eircode addresses, which had four judgments. This worked out at 7.9 judgments per 1,000 addresses. A similar concentration of judgments was entered against tax defaulters in the nearby Ballyboughal district. In fact, the concentration of judgments in these areas was three times higher than most other districts in the top 10. The other north Dublin districts to feature were Dublin 15, Rush, Lusk, Swords and Skerries. 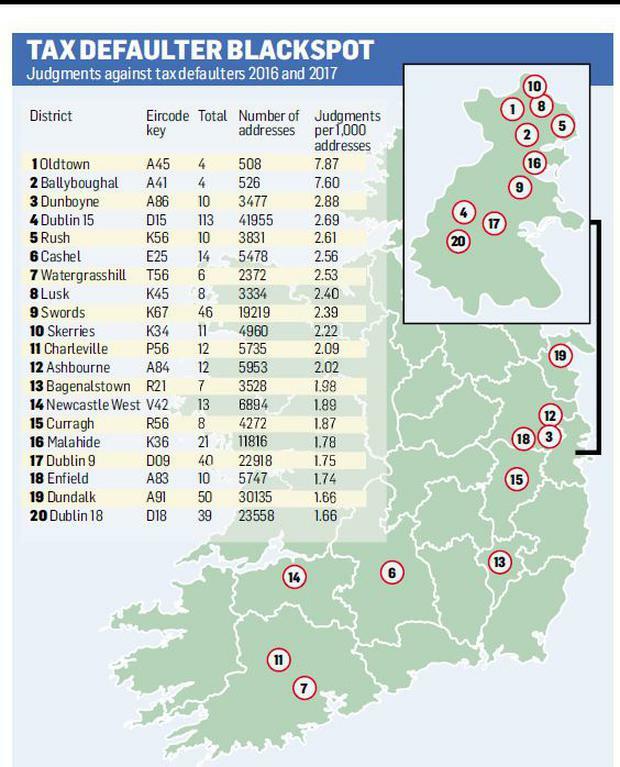 The only non-Dublin Eircode districts in the top 10 were Dunboyne, Co Meath; Cashel, Co Tipperary; and Watergrasshill, Co Cork. In stark contrast, no tax defaulter judgments were entered against anyone in Ballyhaunis, Co Mayo; Boyle, Co Roscommon; Belturbet and Cootehill, Co Cavan; Carrignavar, Co Cork; and Cahersiveen, Co Kerry, over the past two years. Only one tax defaulter judgment was entered in each of the districts covering Ballinrobe, Co Mayo; Clones, Co Monaghan; Crookstown, Co Cork; and Garristown, Co Dublin, in the past two years. The Revenue secured judgments worth €55.8m against 1,422 individuals and companies in 2016, and judgments worth €50.2m against 1,408 parties last year. Meanwhile, an analysis by StubbsGazette of bankruptcy statistics over the past five years reveals Newbridge, Co Kildare, is the district with the largest proportion of bankruptcies in the country. There were 34 bankruptcies there in that timeframe, working out at 3.33 bankruptcies per 1,000 addresses. Two other Kildare districts, the Curragh and Kildare Town, also had proportionally more bankruptcies than most other Eircode districts. StubbsGazette managing director James Treacy said there was likely to be a number of variables at play to explain this, including the fact a very strong personal insolvency practice was operating out of Newbridge. Other areas with proportionally higher bankruptcy levels than elsewhere include Dunshaughlin, Co Meath; Cobh, Co Cork; Cootehill, Co Cavan; Ballymote, Co Sligo; and Wicklow Town.